In recent years scholars and researchers in all disciplines have moved away from traditional quantitative methods of research to more qualitative methods which emphasize questions of meaning and interpretation. Considering research methodologies as a set of idioms, The New Language of Qualitative Method examines alternate vocabularies for conveying social reality. It offers a new theoretical view which reintegrates the traditional emphasis on the whats of social life with a contemporary understanding of the hows and whys. The text considers the basic presumptions, objectives, and research questions of four major research traditions: naturalism, ethnomethodology, emotionalism, and postmodernism. Using illustrations from classic texts, it shows how each idiom supplies a unique perspective on empirical reality. The text then examines the risks and rewards of each approach, offering a vision of a renewed language of inquiry that accommodates both traditional and contemporary concerns. Striving for balance, the authors not only contend with issues from alternate perspectives, but provide a basis for rapprochement between research traditions that have often remained isolated from each other. They also demonstrate how each approach may be used for research on family, aging, deviance and social problems, and organizations and institutions. 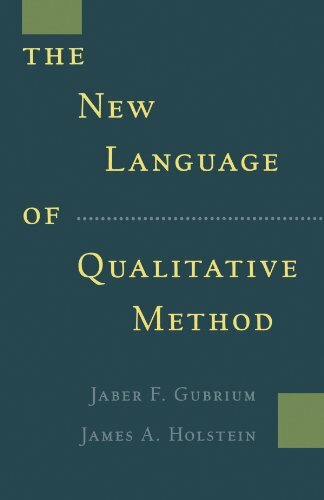 Written in an accessible and engaging style, The New Language of Qualitative Method can be adopted in courses across the social sciences, and may also be used by a broad spectrum of qualitative researchers.